A slightly odd trip, originally to take in a PFT Belgium/France tour tomorrow. This foundered on the rocks of SNCF and SNCB cussedness, ‘despite PFT giving the full 10 weeks notice’ – where have I heard that before. So to use the flight reasonably productively, Korbach and Marienheide are the targets. First stage was to be the 0724 Wellington - BNS but due to late running (of me) I ended up at Telford Central, on the preceding train – just. A very threatening announcement about penalty fares just annoyed me enough (I had a valid ticket) to want to write to CT management. No doubt I won’t. [I didn’t.] The result of catching the earlier train was a very early arrival at Birmingham Irrational, for a quick check-in at about 0830 for SN2040 at 1020 to Brussels. It went on time, mercifully, and SN Brussels BAe146. No worse than anybody else’s, nor better. Cloudy all the way and a rather interesting descent but we arrived safely and on time for 1230, so no problem. My Internet-booked Sparpreis return to Köln caused some consternation at the NMBS/SNCB booking office because it had one too many characters in the booking reference… they got it sorted eventually and I got the 1306 to Gent which was a nice smart class 41 (?) a newish 4 car EMU anyway. Leaving La Lunette in what I thought were dry conditions I was soon proved wrong! Retired therefore to L’Ecuyer at the other end of the square (do squares have ends?). This proved to be very expensive and very reluctant to serve grockles. I turned this to my advantage by leaving beerless, which was no great disappointment with a beer list so poor that I’d settled on draught Leffe Blonde, at a price higher than two Telford pubs which serve it! A very straightforward, if damp, walk along Boulevard Anspach to Au Laboreur which was its usual empty and efficient self, dispensing my usual Hapkin (thought they were going to stop brewing it years ago?) at a more reasonable €2.50. And so to Bruxelles Midi/Brussel Zuid where the ICE to Köln and Frankfurt was waiting. No great surprise, as I’d observed it go by from my seat in au Laboreur! Armed with a Westmalle Tripel from the supermarket I set off for Köln, noting nice new flyovers/diveunders just before Schaarbeek and Leuven. Still major engineering going on between Welkenraedt and Aachen – will it ever end? We appeared to be late at Aachen but obviously weren’t, as the sprint to Köln got us there at 1845. Round to the hotel (Central, An den Dominikanern 3), perfectly adequate for €39 though more might be questionable, and back to Köln Hbf for a ticket, a bratwurst – wonderful – and the 1924 to Marienheide, unsurprisingly a 642. Made it to Marienheide in pouring rain – arriving at 2045 in deep gloom it was hard to imagine that it was another half hour to sunset (even though it was!). A picture of sorts was managed and a brief walk in the rain as far as the high street yielded little of interest, though it seemed a nice enough place. The station has been mostly taken over by Lidl and another supermarket, who have grudgingly yielded a little under 2 metres to DB for their platform. Beyond the platform the track is heavily overgrown and it doesn’t look as if reopening to Brugge will be any time soon. Stopped off at Gummersbach on the return to visit Brauhaus Gummersbach (out of station, past bus station, turn left at end of Bahnhofstr., 50m on left.) A most excellent modern beerhall with Oberbergbräu (unfiltered, slightly darker than pils, more like bitter) and Oberberg Pils. The O/bräu was excellent at €2.40/0.4l. They also had a weizenbier, not all that exceptional. I’d back the ‘cooking’ O/bräu. The usual well run German establishment, no music but everybody enjoying themselves. Not quiet, but not rowdy either. Would that we could do the same (well, we can, but not often enough). There seemed to be seasonal beers as well. On the way back, noted that the Postschenke on the corner of Bahnhofstrasse advertises Zunft Kölsch. Presumably PR and I had this when in there a few years back. 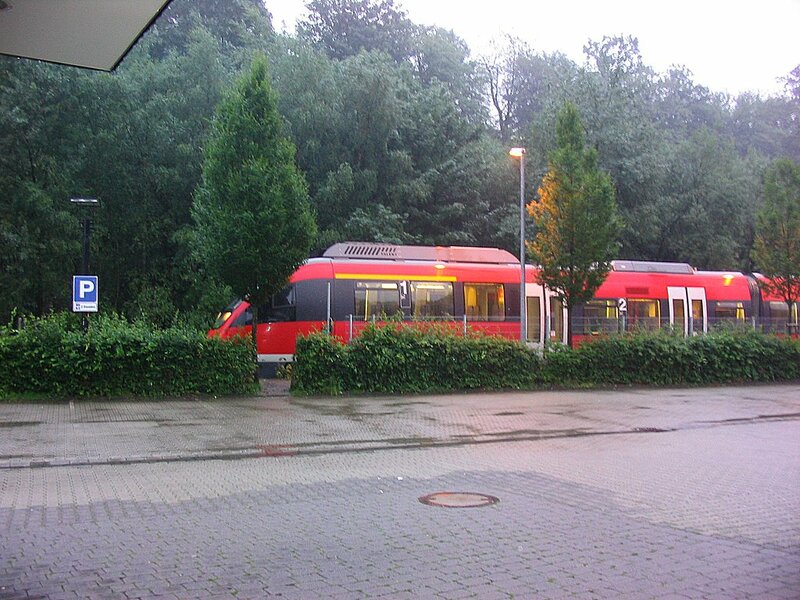 Still raining when the train left Gummersbach at 2223 but on arrival at Köln Hbf at 2336 it had finally stopped. In a country not generally notable for really smart stations, half of Brussel Zuid/Bruxelles Midi stands out! 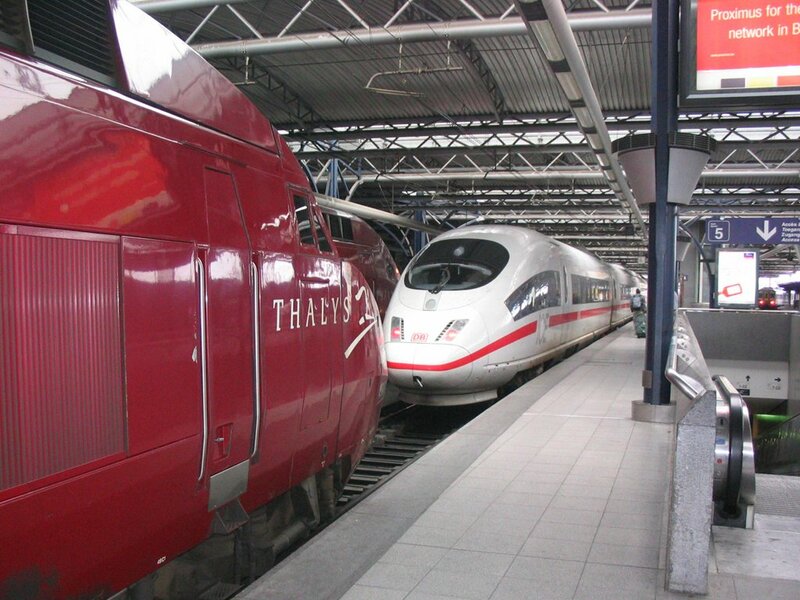 Here a Paris bound Thalys TGV is waiting to leave and a DB ICE from Köln has just arrived on the right. Quite late that evening I was struggling with rain and bad light but managed this shot of a wet DMU at Marienheide, current terminus of the Köln-Brugge line. Nice breakfast was all ready just before 0700, leaving adequate time to consume same before going over to the station for the 0732 RE to Düsseldorf, 146 propelled. On from there on another RE to Hagen, haulage not observed. On to the karts at Hagen with a pair of 612s forming the 0913 to Kassel-Wilhelmshöhe. This was full, for no apparent reason, but not quite to the point of standing. The train was late away but managed to pull back most of the time without any obvious effort. The connection for Korbach (a 628) was waiting at Brilon Wald and left quite full though two large parties (one seemingly a ‘hen day’) decamped at Willingen. Just before Usseln we made what seemed to be an emergency stop – engineering work was in progress but nothing much seemed to be happening. The cutting sides looked very unstable, with a couple of slips, and it looks as if there is still work to do despite the lengthy closure beyond Willingen. Usseln has new platforms and a loop, as does Willingen. We crossed a service from Korbach at Willingen but the loop at Usseln doesn’t appear to see much (or even any) use. Lots of cloud and a bit of rain just before Brilon Wald, but the sun appeared before Korbach making for a very pleasant run over the last few miles which, though the hills are never far away, is fairly wide open. Very pleasingly, the Brilon Wald trains use the bay platform (4) on the east side, thus ensuring that the physical connection with the Kassel – Korbach Süd line gets done. Oh no it doesn’t – Brilon Wald line goes over the Kassel line by a bridge! Couldn’t see the layout from where I was sitting so maybe [definitely!] the connection didn’t get done. Back to Brilon Wald anyway, then on to Hagen with a pair of 628s, the front one virtually empty as far as Neheim-Hüsten. Successful attempt at Hagen to get two timetable CDs – missed the 1402 to Düsseldorf though because of going back to the Reisezentrum to make sure they were Europe ones. They are. Allegedly. [To do justice to the Reisezentrum, they were.] 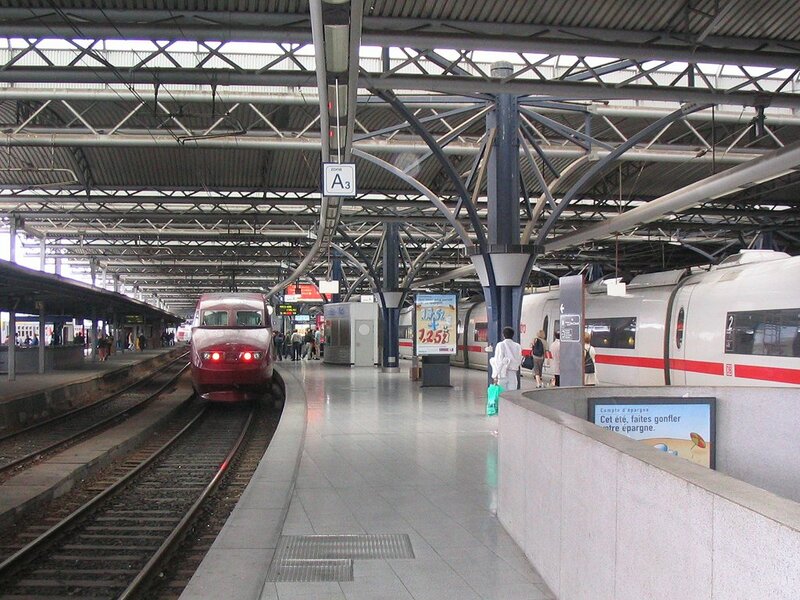 On therefore by the 1432 to Aachen, alighting therefrom at Düsseldorf Hbf to watch the rain for a while. Remarkably heavy, in fact. Just before heading for Köln I realised there was an S28 about to go to Kaarster See. Believing [rightly] this to be new track beyond Kaarst Bahnhof I dived on and had an exciting trip to K.S. There appears to be some sort of industrial facility just beyond the station which is a simple island platform with no run round facility. Back in time to miss the 1658 and 1701 to Köln so I had to wait for the 1740. After a wash and brush up at the hotel I set off to Schönberger Strasse for the Küppers brewery tap which appears to have become the Dom one. Can’t be doing with Dom so I repaired on foot to a U-Bahn stop whose name escapes me and thence to Barbarossaplatz for home brews. Weissbräu (from Barbarossaplatz turn left where the trams do, into Salierring. Then first left into Trierer Strasse and it’s at the next junction, on the left) was first. Excellent weizenbier, though at €3.10 the half litre a little expensive, but a huge and rather poor schnitzel. Less of it, and better, would have been preferable. On then to Hellers in Roonstrasse. It’s about 50 metres north of the Roonstrasse/Zülpicher Strasse junction, on the left. Easily walkable from Köln Süd by Moselstr. and Zülpicher Str. (head into town away from the railway on Zülpicher Str. then turn left into Roonstr. and it’s on the left), Zülpicher Strasse tram stop or Barbarossaplatz tram stop. The beers are a Kölsch, an unfiltered version of the Kölsch called Wiesse, and two others which I didn’t note. I tried the Wiesse which comes in 30cl measures. A very cloudy beer with (to me) an unique taste. Pleasant enough though, and it’s a good honest pub! Finally back to the hotel by trams 9 and 16, for an earlyish night. 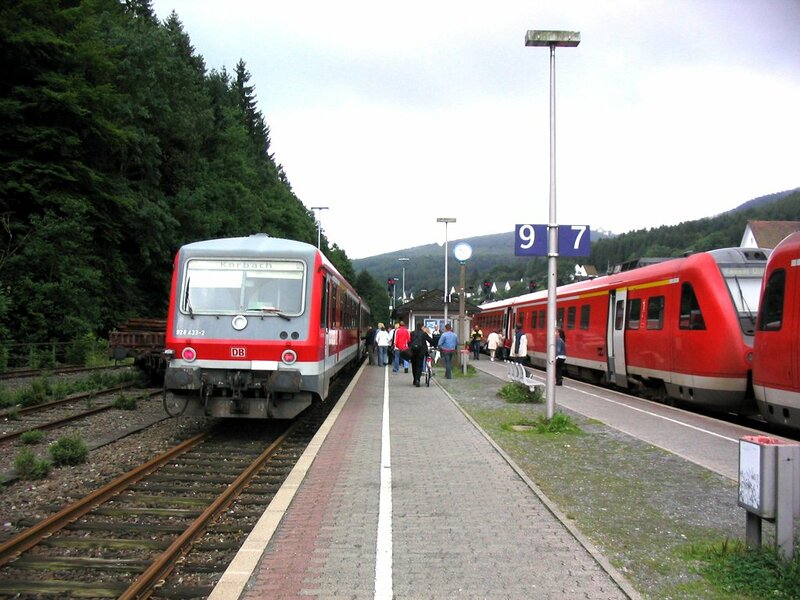 The next day I was at Brilon Wald where the 628 on the left is waiting to go to Korbach, connecting with a Hagen-bound RE on the right. 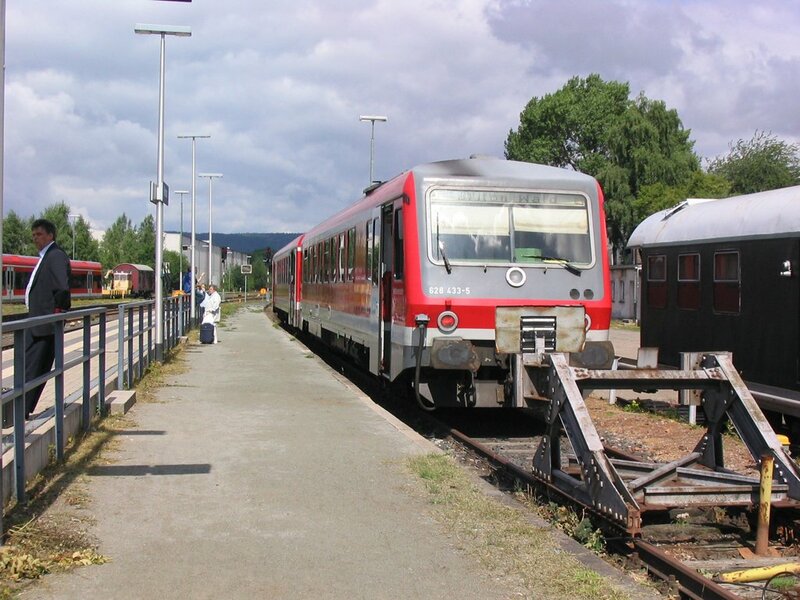 The train from Brilon Wald stands in the east side bay at Korbach; unfortunately the Brilon line crosses over the Kassel line just north of the station and the two operate as effectively separate lines. Raining again – but by the time I’d showered, breakfasted (same as yesterday and none the worse for that), packed and paid the bill it had stopped. I was able to go and goggle at the cathedral – spectacularly expensive and labour intensive when most people only owned what they stood up in – and take a few pics of ICEs et al., on the approach to the Hohenzollernbrücke. My facing window (or rather, non-aisle) seat on ICE16 was unfortunately facing a blank panel… you can’t win ‘em all. 3 minutes early at Aachen having hit 250 kph en route. After a sunny spell to Aachen, the rain was back in the Ardennes. Despite many valiant efforts by SNCB to delay us we arrived dead on time at Liège Guillemins, whose perpetual/eternal rebuilding continues apace. Or not. Looked the same as it did 16 months ago – a complete shambles. Fairly leisurely up the bank to Ans but more vigorous thereafter. We hit the high speed line at about 140 kph, then impressive acceleration to 240. Why no faster wasn’t apparent, presumably the schedule doesn’t require it. 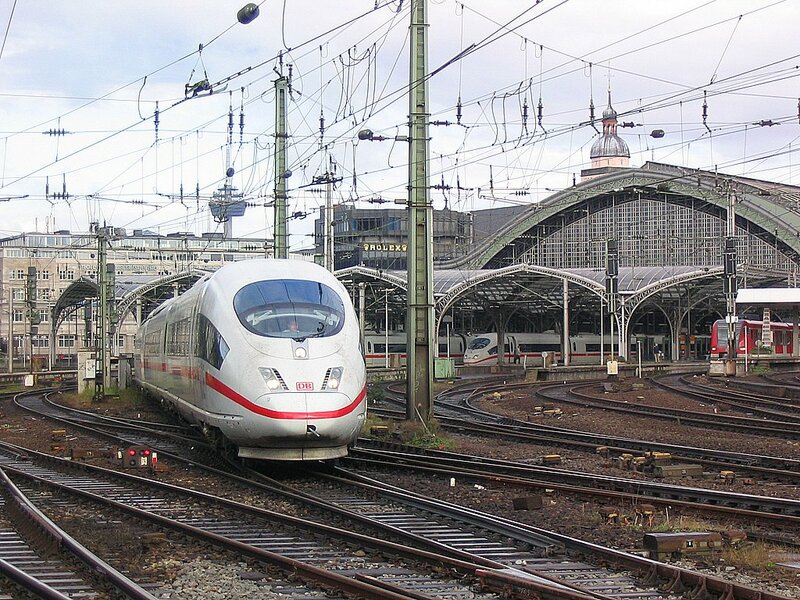 A noticeably smoother ride on the dedicated high speed line than on the fettled up Köln – Aachen run, which doesn’t make a great deal of sense. More serious attempts to delay is and prevent the booked 1132 arrival – a dead stand for a couple of minutes at Leuven and much crawling for the rest of the way. We arrived in Brussel Zuid/Bruxelles Midi at 1132. Not 1131, nor 1133… Looks like 240 kph was the right call. Round to Rue de la Colline and Les Brasseurs (it’s just off Grande Place, nearest corner to Central/aal). Nice pub in the Les Brasseurs way, with a very pleasant unfiltered blanche, more fruity than anything and just right to start the day. Don’t panic, it was 12 noon. Well, almost. Then through the superb arcade to La Morte Subite, whence I was ejected to wait for opening at 1300. Arriving back at 1302 I found it in full swing, and a wonderful drinking shed it is too. Faded (very) grandeur! Nice Chimay Blonde on draught – nice enough to make me reconsider my [resolutely anti] position on Chimay. Insane prices of course. The décor dates from 1928 according to their blurb, and definitely hasn’t been touched. A tourist trap of the first order, but loveable none the less. Back to Central/aal for the 1353 to the airport on which a bewildered gripper didn’t seem to understand my ticket but didn’t query it either. Electronic checkin was wonderful as usual but all the windows were taken except 17A despite me being 70 minutes before departure. Never sit in 17A on an RJ85. It brings a new dimension to cramp, not to mention sideways movement in cross winds (there was one). Vanilla flavoured apple cake again, with a cup of coffee which was surprisingly enjoyable. Despite being told we’d be 10 minutes late because of the incoming flight being late (it was) we pushed back only 2 late and touched down at 1545, the booked arrival time (though I count it when I get to the terminal building!). Thence to Birmingham Irrational for the replacement bus to BNS which would have been on time had it not been for the horrendous congestion in Smallbrook Ringway. In time, nevertheless, for the 1703 to Glasgow Central formed from 2Xsuper Voyageur. The vestibule doors had both failed in my coach, allowing us all to enjoy the full horror of the now infamous smell from the toilets. They really, really should fix this on both the Voyageurs and the Bendyleanos. The conductor was a comedian, offering among other things the chance to alight at Motherhell. Stuck at Wolvo for an hour, the Great Western seemed a good idea – but it was shut. The bar staff couldn’t be bothered serving customers at the Posada, so it was E(n)ville White at the Hogshead. Pretty poor too. And so to the 1827 all stations to Shrewsbury, a bit of a comedown from the ICE which started my day! The next (and last) outing for 2005 was based on another large scale plandampf in Germany, along with various bits 'down south' and a couple of days in the Czech Republic.